So the Senate took Friday off, wasted Monday in the predictable futility of failing to pass a nonbinding nullity, a resolution expressing constitutionally irrelevant lack of confidence in the attorney general, then debated lowering gasoline prices -- or cooling the planet; or something -- by spending taxpayers' money to raise food prices. It took up legislation to quintuple the mandated use of mostly corn-based ethanol, which already has increased Americans' food bills $14 billion in the last 12 months. For such silliness, Reid scuttled the bipartisan attempt to improve the eminently improvable immigration status quo. Senators from both parties who are trying to resuscitate the bill surely read last weekend's Rasmussen poll recording public approval of Reid (19 percent) far below the president's pathetic 36 percent. Democrats who control this floundering and roundly disapproved Congress are paying a painful price for the pleasure of defeating everything that could be construed as in any way an achievement by the president. Granted, Reid is just one reason for the immigration legislation's parlous condition. Another reason is that lessons from 14 years ago have been forgotten. In his new biography of Hillary Clinton, ``A Woman in Charge,'' Carl Bernstein recalls April 23-25, 1993, the 94th, 95th and 96th days of the Clinton administration, when the president and Mrs. Clinton attended a retreat with Senate Democrats in Williamsburg. It was already clear that the Clintons were not going to fulfill their promise to present ``comprehensive'' health care legislation within their first 100 days. Bernstein reports that two of the most respected and, for Mrs. Clinton's purposes, most important senators, Pat Moynihan and Bill Bradley (both were on the Finance Committee, which would handle her legislation; Moynihan was chairman), were appalled by her highhandedness. Bradley asked her if the tardiness in delivering her bill would complicate passage by making the bill competitive with other legislative goals, and he suggested that some substantive changes in her proposal might be necessary. Bradley and Moynihan heard this, Bernstein says, ``with disgust and distrust.'' Her plan never even came to a vote in a Congress controlled by her party. And, hark! what discord follows. Third, people skeptical about the legislation were, if not demonized, cast as bigots or, at best, people uninterested in doing ``the right thing for America'' (President Bush). 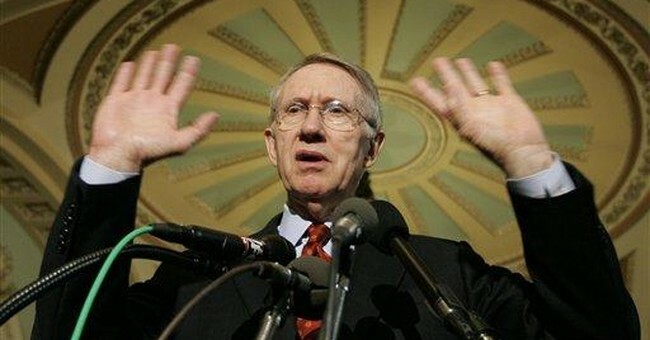 Perhaps Reid, in his rush to truncate debate, was being chivalrous toward Speaker Nancy Pelosi. Suppose Senate Republicans agree to expedited handling of the legislation so the Senate can get on with whatever folly Reid next considers urgent business. And suppose 60 senators can force a final vote on a bill that retains the most important provisions -- increased border security and electronic identity verification. Many businesses, which profit from being magnets for illegal immigration, think being part of law enforcement is an intolerable nuisance, which is heartening evidence that workplace enforcement might work. If the Senate passes a bill, immigration then becomes a hot potato for the House, where 61 of Pelosi's Democrats represent Republican-leaning districts (Bush carried them). Hark! what discord will follow. What fun.